About four metres of lawn are all that separate Cameron Cottage from the shore of Britain's most famous water - Loch Ness. The views from most of the windows are breathtaking, the mood of the Loch and hillsides changing constantly with the wind and the light. To the right, Dores Bay, with peaceful walking opportunities, and to the left the full 22 mile length of the Loch. In contrast, a more modern kitchen and dining area has been added to the loch side of the house to make best use of the stunning outlook. With full central heating, the small open fireplace in the living room is hardly required, but provides that cosy glow when the weather outside is not so good. 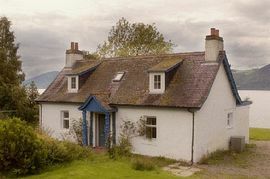 The cottage is located in the tiny village of Dores (population about 150), but the trees and the positioning of the cottage means that you are barely aware of the buildings on either side. One of these buildings is the equally old-fashioned Dores Inn, with an excellent and reasonably priced menu. 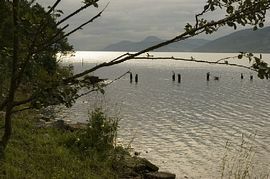 Dores is about 8 miles from the centre of Inverness, on the quiet B862. Apart from the facilities which the city has to offer, Inverness is also the hub from which roads radiate to all parts of the Highlands, making this an ideal base for day trips. 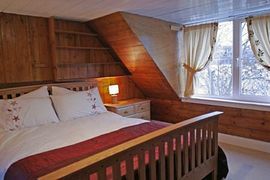 To sum up, comfortable accommodation, idyllic outlook, central location and handy for the pub! What more could you want? From the Inverness southern ring-road, take the B862 to Dores - approximately 5.5 miles. Cameron Cottage is the first private house on the right, immediately after the Dores Inn. Christmas and New Year: £550.00. "The scenery and setting were brilliant. 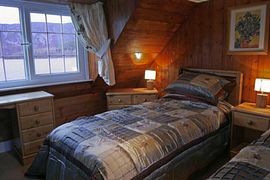 Your cottage is stunning - very homely, comfortable and beautifully decorated. We are hoping to return!"